Dressing a location is the art of altering things enough to enable a suspension of disbelief. Think theatre! Walls that are not solid are accepted as real. it is the same for live role play. Imagination coupled with a couple of curtains can result in a splendid wall for a throne room! Look at the picture below. This was an in character area for Lord Flint to use at the 2002 Renewal. Read below to see how we converted an old awning into this. The main structure is a fly sheet for a 14 food rige tent. One side was pegged out as normal and the other was propped up on a spare set of poles. We divided it into two using one side for a communal kitchen and the other for the throne room. Using a spare rope we could put up hangings to make the walls. Most of the hangings are old sheets and duvet covers. The floor was bare earth. We covered this with sacks and an offcut of carpet. 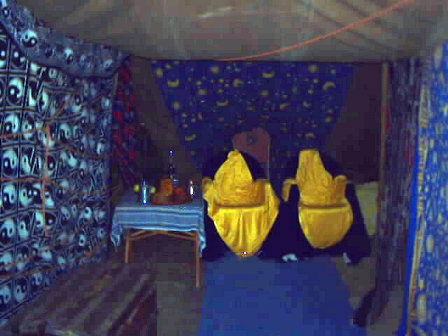 The thrones are two old plastic garden chairs with blue velvet cutains draped over them and smaller gold curtains arranged on top. A table with a headscarf draped over it and an old chest complete the furniture. Tankards, wooden plates and bowls, fruit and an old bottle on the table were the finishing touches. OK! That was big. The principles work on any scale. Drape cloths over chairs to hide their being modern. Use hangings to hide things and create 'walls' and cover the ground (or flysheet) to alter the floor. Furs, tartan decorated blankets, throws, sheets, duvet covers and so on can all be used to hide modern furniture, airbeds, modern bags and so on. Wooden plates and bowls, leather or metal tankards, candles, old or odd looking candle holders, those cane covered barbeque lamps, old bottles and jars, some pottery ware, suitable oil burners, some oil lamps and many other odds and ends can all be used to enhance the feel of the site. Garden canes, sticks, branches, poles and even smaller tree trunks can be lashed together to make racks, gateways and other camp furniture as well as fences. If you don't know how find a scout or guide leader to show you, buy a book on the subject from a shop that supplies your local scouts or guides or even find a book in the library. A number of small candles set up on branches in a suitable tree (becareful! improperly placed they can be a fire hazard, don't do this unless you know what your doing) can provide a magical effect especially if combined with crystals or white feathers arranged to reflect the light. It has been raining and there are puddles around. Use it! Stick garden flares where they will reflect in the puddles. As well as looking good they show folk where the puddles are! Flags and banners tend to draw folks eyes away from the modern tent they are flying over and a 'washing line' with banners hanging from it can effectively hide a tent behind it! -- Thanks to James of Reading for this. In non combat areas 'fences' can be made with sticks and rush mats. Fasten the short ends of the mat around two sticks leaving about 10 to 12 cm at the top and enough at the bottom to stick in the ground. Roll this up with two sticks about 10 cm longer than the mats. When you get on site, unroll the mat, lash the two longer sticks above and below the mat (to form a 'frame') and stick it into the ground. If the wind threatens to blow it over it is easy to use string and pegs to keep it up. A number of these with loops of string holding them together forms a creditable and easily transportable fence. -- Thanks to Matthew of Bologne for this.